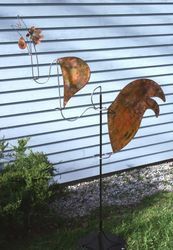 The following hanging mobiles and stabiles are intended for contemporary or traditional outdoor settings. 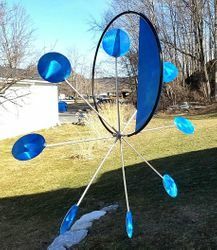 They can be positioned in a garden or on a patio, hung inside a porch, from the eves on a deck or from a tree. Several designs include a base so placement can be easily changed. All the pieces are signed and dated by Joel Hotchkiss. The materials which are copper, brass and aluminum and stainless steel. The copper is are lacquered to preserve the finish.